Menkit's reaction to the vicious slaughter by Chris Palmer to kangaroos is an understandable normal human reaction. The slaughter and abuse of Australia wildlife makes my blood curdle. "My son is an up and coming roo shooter to at the age of 4 he can skin and gut a roo nearly as quick as me and over the last 4 weekends he has shoot over 50 roos with only 8 misses they still didnt get away tho like always dad was there to clean up the mess." Clearly, this individual values his behaviour of slaughtering kangaroos acceptable to the extent he is inculcating in his young son his same values, attitudes and practices from an early age. Shooting wildlife is a violent crime against the natural animal kingdom. We are not savages anymore. We don't have to kill wild animals. It is a choice and an immoral act. Clean kills are wrong but also occasional. The suffering death of a bullet injury by a 4 year old followed up with a knife or blunt axe to the joey reflects a vicious and depraved existence. 'According to a 1997 study done by the Massachusetts Society for the Prevention of Cruelty to Animals (SPCA) and Northeastern University, animal abusers are five times more likely to commit violent crimes against people and four times more likely to commit property crimes than are individuals without a history of animal abuse. The line separating an animal abuser from someone capable of committing human abuse is much finer than most people care to consider. People abuse animals for the same reasons they abuse people. Some of them will stop with animals, but enough have been proven to continue on to commit violent crimes to people that it's worth paying attention to. Virtually every serious violent offender has a history of animal abuse in their past, and since there's no way to know which animal abuser is going to continue on to commit violent human crimes, they should ALL be taken that seriously. FBI Supervisory Special Agent Allen Brantley was quoted as saying "Animal cruelty... is not a harmless venting of emotion in a healthy individual; this is a warning sign..." It should be looked at as exactly that. Its a clear indicator of psychological issues that can and often DO lead to more violent human crimes. "So much of animal cruelty... is really about power or control," Lockwood said. Often, aggression starts with a real or perceived injustice. The person feels powerless and develops a warped sense of self-respect. Eventually they feel strong only by being able to dominate a person or animal. Sometimes, young children and those with developmental disabilities who harm animals don't understand what they're doing, Lockwood said. And animal hoarding - the practice of keeping dozens of animals in deplorable conditions - often is a symptom of a greater mental illness, such as obsessive-compulsive disorder. Just as in situations of other types of abuse, a victim of abuse often becomes a perpetrator. According to Lockwood, when women abuse animals, they "almost always have a history of victimization themselves. That's where a lot of that rage comes from." Whether a teenager shoots a cat without provocation or an elderly woman is hoarding 200 cats in her home, "both are exhibiting mental health issues... but need very different kinds of attention," Lockwood said. Those who abuse animals for no obvious reason, Lockwood said, are "budding psychopaths." They have no empathy and only see the world as what it's going to do for them. * Patrick Sherrill, who killed 14 coworkers at a post office and then shot himself, had a history of stealing local pets and allowing his own dog to attack and mutilate them. * Earl Kenneth Shriner, who raped, stabbed, and mutilated a 7-year-old boy, had been widely known in his neighborhood as the man who put firecrackers in dogs? rectums and strung up cats. * Brenda Spencer, who opened fire at a San Diego school, killing two children and injuring nine others, had repeatedly abused cats and dogs, often by setting their tails on fire. * Albert DeSalvo, the "Boston Strangler" who killed 13 women, trapped dogs and cats in orange crates and shot arrows through the boxes in his youth. * Carroll Edward Cole, executed for five of the 35 murders of which he was accused, said his first act of violence as a child was to strangle a puppy. * In 1987, three Missouri high school students were charged with the beating death of a classmate. They had histories of repeated acts of animal mutilation starting several years earlier. One confessed that he had killed so many cats he?d lost count. Two brothers who murdered their parents had previously told classmates that they had decapitated a cat. * Serial killer Jeffrey Dahmer had impaled dogs? heads, frogs, and cats on sticks. * Harris and Dylan Klebold, who shot and killed 12 classmates before turning their guns on themselves, bragged about mutilating animals to their friends. As powerful a statement as the high-profile examples above make, they don't even begin to scratch the surface of the whole truth behind the abuse connection. Learning more about the animal cruelty/interpersonal violence connection is vital for community members and law enforcement alike." 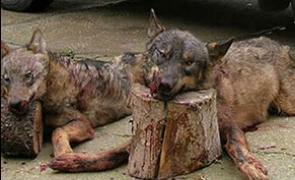 It is a fact that acts of animal cruelty lead to forms of cruelty against humans. "A criminologist and forensic psychologist at Bond University, said the torturing, maiming and killing of animals were red flags of someone capable of future violence against people." They go on to state specific cases: "Archibald McCafferty, Sydney's 'Kill Seven' murderer, used to strangle chickens, cats and dogs before killing people." "In Victoria, serial killer Paul Charles Denyer disembowelled a native cat and cut the throat of its kittens." 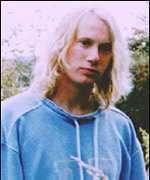 "Martin Bryant, who killed 35 people at Port Arthur, tortured and harassed animals at age seven, which was one of the first red flags he was a person with severe conduct disorder symptoms." 'A young koala is fighting for its life after it was wounded in a cowardly shooting at Morayfield, north of Brisbane. Moreton Bay Koala Rescue president Annika Lehmann said the young male koala, estimated to be about eight or nine months old, had been taken to Australia Zoo for treatment. The 940-gram koala, which had been named "Doug", was in an induced coma. He was found at the base of a tree at J Dobson Rd in Morayfield, Ms Lehmann said. "Our rescuers got a call this morning about a little joey sitting at the trunk of a tree and his breathing was laboured," she said. "Mum was 30 metres up in the tree, so we needed tree climbers to get her down, but the little boy was sitting at the bottom of the tree, so he was easy to get." Ms Lehmann said it was unclear how long Doug had been suffering as a result of the attack. "He was very lethargic and dehydrated, so we don't think this happened this morning or yesterday, it might have happened one or two days ago," she said. "At first we thought he had pneumonia, but when he had an x-ray they discovered the two bullets. "One is in the left chest cavity and one is in the lower abdomen." Ms Lehmann said Doug's mother, which could also have been wounded, was also being assessed. "I can't really say much about her condition, but it looks like she's OK," she said. Ms Lehmann said she had never seen a koala shot in the area before, although she was aware of several kangaroos shootings. "Morayfield is one of those areas that we feel koalas are still relatively safe, so it was really bad that we found him there," she said. RSPCA spokesman Michael Beatty said the attack was disturbing, with the joey a "50/50 chance" of survival. "At first glance, because it was a slug gun that was used, it's probably kids but we really need to catch those who are responsible," he said. "All too often we've seen in the past the links between animal cruelty and other forms of violence down the track, so if this was kids they need to be made to be accountable for their actions now to nip something like this in the bud." A criminal psychology research article by Robert Agnew of Emory University, USA, entitled: 'The Causes of Animal Abuse: A Social-Psychological Analysis' presents a theory that explains why individuals engage in animal abuse. "First, I describe the immediate determinants of animal abuse. Animal abuse is said to result from ignorance about the abusive consequences of our behavior for animals, the belief that abuse is justified, and the perception that abuse is personally beneficial. Second, I describe an additional set of factors that have both direct effects on animal abuse and indirect effects through the above three factors. These additional factors include individual traits, like empathy; the individual's socialization; the individual's level of strain or stress; the individual's level of social control; the nature of the animal under consideration; and the individual's social position." As disgusted as nearly all Australians are with animal abuse, Australia's animal protection laws remain are inadequate both as a deterrent and as a punishment. Wildlife killing and abuse is morally unacceptable and should be made a crime in the same way that killing or abusing humans is a crime. All that would be required is adding an animal section to the existing crimes acts around the country. Our police are not required to enforce animal cruelty breaches. Instead it is relegated to an under-resourced, under-equipped RSPCA, which is at best a toothless force. Australia should set a moral standard, establish a national squad within the Australian Federal Police to deal specifically with animal abuse. Australia needs to set up a central database on animal killers and abusers just as in the same way paedophiles are monitored as social deviants. Additionally, Australian police often kill injured kangaroos using a shotgun which always requires multiple shots and is not humane. Why are they not educated about how to humanely kill a large animal? Better still, why don't they consult with a vet and wildlife carer first to see if the animal could be rehabilitated? So much is wrong with Australia's attitude to animals I barely know where to start. Most likely it starts because humans think animals were put here for humans to eat, wear and experiment on. None of these animal torturers had the slightest concern for their victim. If we respected all creatures and were proper caretakers (the real meaning of dominion in the bible) we would never hurt another soul. And please don't tell me animals don't have souls! 40 years ago one never heard of so many incidents of cruelty such as the story of the shooting of the baby koala. This is just my observation but it appears to me that our standards have nosedived. I am shocked that the kangaroo shooter would allow his 4 year old to shoot kangaroos or to shoot any animal for that matter. A 4 year old simply does not have the motor coordination to shoot a moving target in the area needed to kill the animal cleanly without prolonged suffering . In addition I consider this a form of child abuse as the child needs to understand what he is doing since he is causing immense suffering. What option does a 4 year old have of declining to do as his father asks ? What understanding does a 4 year old have of the why he is committing the act of shooting an animal? If he is told that it is because his father thinks it is a cool thing to do what sort of questioning of authority will he learn? Even if in an extreme situation kangaroo meat were needed for food I still question whether it is appropriate to let a 4 year old practice his shooting skills on a real animal. The other theme that emerges in the article above is that animal cruelty is terrible because it leads to a transfer of this cruelty towards humans. Surely the act of cruelty is abhorrent in itself no matter who the victim? A person who is addicted to cruelty has a diseased mind and urgently needs treatment for this. If cruelty in our society is increasing then our society urgently needs treatment. Our social leaders, lawyers, and politicians are addicted to money. For this reason, the rights of any human or non-human animal, which is not a direct source of financial income, to a peaceful existence, are discounted and often obliterated. In general you can only get effective access to legal defenses if you have a lot of money and also if you can prove that you have been deprived of income by your adversary. This means that the poor cannot get justice and also that if your environment is destroyed for someone else's profit, but you only lose ammenity rather than suffer direct financial loss, you have no case in Australia, with some rare regulatory exceptions. Our treatment of kangaroos and other animals is a symptom of this. The vast gaps in status between humans is another symptom. The most prevalent kind of cruelty is industrialised cruelty which permits an immense profit margin to be created by treating farm animals as if they were not alive in intensive farming. It is the same kind of mentality which saw ethnic persecution raised to new heights in Hitler's regime, which industrialised ethnic persecution to make a profit from it, by working people to death, even 'value-adding' in some cases where individuals reputedly made soap and lampshades out of human tissue. All creatures live by death - be it plant death or microbial death. We are genetic organisations of microbes - bacterial and microbial. (Lynn Margulis and Dorion Sagan, Acquiring Genomes, Perseus, 2002; Frank Ryan, Virolution, Collins 2009) In our bloodstreams micro-organisms stalk eachother and viral components of genomes define and defend our external territory. There is no way that we can ever get away from death. The tradition of a man introducing his son to hunting is an old one. It is the industrialisation of the killing traditions which seems to me to be so obscene and dangerous. The use of a gun is an industrial technique which greatly magnifies the reach of one person over another person or animal. With our industrial sized populations there is no way that high tech hunting can be fair or sustainable on other species. The killing of an animal for food, done directly by a person for their own survival is quite different from the killing of animals for profit and for other peoples' food, which distances the consumers from the moral and energy cost of their food supply. This distancing has coincided with default acceptance of cruelty, where once the cruelty would probably have been avoided in most circumstances, because of its emotional cost. There were traditions in hunting and gathering cultures of honouring the animal killed for food, and other traditions to spare different species or reduce the numbers killed. Industrialisation not only oppresses other creatures; it oppresses workers. Most of us are yoked to the factory system, even if we work in hospitals or offices. The lowest wages go to the people who work in the least humane jobs with the lowest status. The reason is that low status marginalises and disempowers workers and domestic animals, thus permitting greater profits to be made by those who control what they do and is done to them. Thanks you all for your comments. After the cat incident in Cairns, it seems logical that air rifles and bb-guns are those weapons that adolescents get access to before firearms. In The Age newspaper today (6th April 2010) is the story 'Man-mauling wombat felled by axe' by journalists Reid Sexton and Megan Levy. "...Bruce Kringle, 60, lay on top of the animal in a desperate bid to stop the attack in Flowerdale just before 7am. A neighbour heard his cries for help and, after telling Mr Kringle to move off the animal, killed it with a blow from the back of an axe. Geoff McClure, compliance team leader for the Department of Sustainability and Environment, said a wombat attack was extremely unusual." Frankly, I find this hard to believe and indeed suspicious. 'Rogue wombat'. Wombats are native to this part of Victoria. If anything, it is the humans with axes that are the roagues. Did Kringle have a Alexander Pearcian moment after getting on the turps perhaps? Alexander Pearce was that notorious 19th Century convict in Van Diemans Land who butchered his fellow escapees with an axe then ate them, as the recent disturbingfilm portrays. The incident should be investigated by both a RSPCA vet and the police taking account of witnesses, and including a blood alchohol test on both the men, and a background check on Kringle and the 'neighbour' who killed it with an axe for any history of animal abuse. Killing a wombat with an axe? How cruel, vicious and unnecessary! I also found the man mauling wombat story hard to believe. I cannot imagine a non predatory animal such as a wombat gratuitously attacking a human. It doesn't make sense and as my favourite TV judge says "if it doesn't make sense, it isn't true." From what I have heard, you don't want to lack respect for some wombats. A bit like some humans. It's usually an issue of territory and young wombats stepping out to see the world. Have any of you read this story about Denton? It sounds as if Denton was quite traumatised and took it out on people at times. I gather he has his own home now and is probably doing well. Conversely, here is another story about wombats which shows them to be wonderful, gentle companions. In Britain 19th century poets called the wombat "the most beautiful creature of all" and described its gentleness. Hairy nosed wombat in South Australia, a cause well worth supporting. Why is it that every time a kangaroo, wombat, magpie etc allegedly attacks a human there is a media frenzy over the issue. Why will millions of people learn of this "killer wombat" yet remain ignorant of the plight of the Southern Hairy Nosed Wombat whose burrows are being bulldozed, ploughed over or blown up. Dentons story makes for very amusing reading, thanks Sheila. Perhaps more stories like Denton's should reach the mainstream media. Its harder to accept the killing of a wombat with an axe when you are equipped with even the smallest understanding of these beautiful creatures. If anyone wants to read my plea to the roo hunter + poem they can do so here in "Kangaroo Meat - confessions of a wildlife serial killer". I thought since Tigerquoll starts off this article referring to it, we may as well let people read it.